So what of the wines on offer? What new discoveries came to light? Something new to me was the ascendancy of Delaire, now technically called Delaire-Graaff. One of the first wine farms I visited in South Africa, nearly 20 years ago, it has apparently had a large amount of money pumped into it of late, with consistently 4* Platter wines to match. But something new appeared this year, right in time to win a Double Gold, and that was a barrel-fermented Chenin Blanc of great complexity and class. And although R90 might seem steep for a Chenin, it compares well with the esteemed efforts with this cultivar from such experts as Jean Daneel, Ken Forrester and Sebastian Beaumont. Definitely one to take to a dinner party. Other discoveries were old name KWV punting its Mentors range, previously mostly exported. Not cheap either at R110 for the Sauvignon Blanc, the Semillon was also excellent. Other whites worth a mention included Du Preez’s Gold-winning 100% Chardonnay MCC at R75 from the farm, and possibly less from Checkers. With the ubiquitous Pongracz heading for R80 in most locations now, I’d get thee down to Checkers to stock up for Christmas right now. I certainly will be. For value, last year’s discovery Under Oaks from Paarl came up trumps again – this time with a fresh and fruity Chenin that won a Gold and costs just R44 a bottle from the farm, with their equally fine Sauvignon not far behind on quality and cost at R49. In a similar category but from a very different part of the wine-making world comes Gold-winning Bonnievale Cellar’s 2011 Sauvignon Blanc, not only very fine for its R33 cellar price, but also just over 12% ABV, so light on the head and the pocket. Certainly puts my local Durbanville crop of SBs to shame for value for money. Another discovery, but not too surprising a one considering its provenance, was Driehoek Sauvignon Blanc from the Cederberg, only on its second vintage but made by none other than established Cederberg star, David Niewoudt. Full of minerality and cool climate freshness, it is glorious on both the nose and palate. Another Gold for R90. Reds there were aplenty but time was short and the list was long. Only three producers stand out: Hidden Valley’s repeated wins with their eclectic Secrets range – Hidden Secret 2008 (60% Shiraz, 27% Tannat, 13% Mourvèdre) and Hidden Gems 2008 (55% Cabernet/45% Petit Verdot) – show both class and consistency, albeit at a not-too-pocket-friendly R135. Pity they too are not bargains, nor is Saronsberg’s beefy but elegant Full Circle Rhone blend of Shiraz, Mourvèdre and Viognier at R195. But compared to the prices some others were asking, even this could be considered a bargain. And finally, the ever ebullient and imaginative Flagstone. Just the names win me over, even if some of the prices don’t. 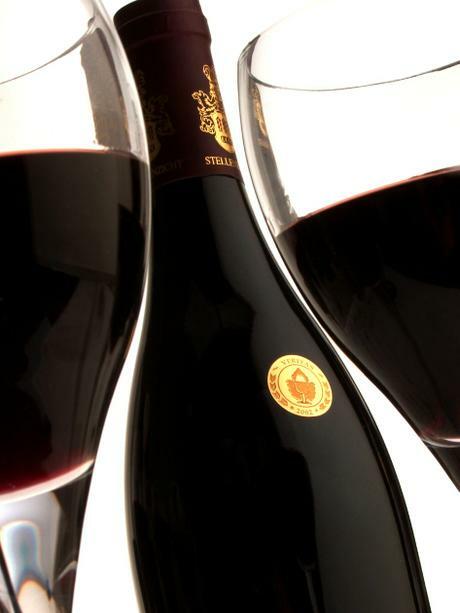 This year Double Golds went to the Music Room Cabernet 2009, named after Bruce Jack’s musical grandmother, and the Writer’s Block Pinotage 2009. Golds went to the Word of Mouth Viognier 2011, which is idiosyncratically lean for a Viognier, but none the worse for it, and also to their flagship barrel fermented Sauvignon/Semillon blend, Treaty Tree 2010. Their Free Run Sauvignon Blanc 2010 only managed a Bronze, while the Dragon Tree and Longitude red blends got silvers. That’s quite a gong bounty and well reflected in the quality of the wines from this always-interesting stable. No bargains, but lots of quality and longevity. 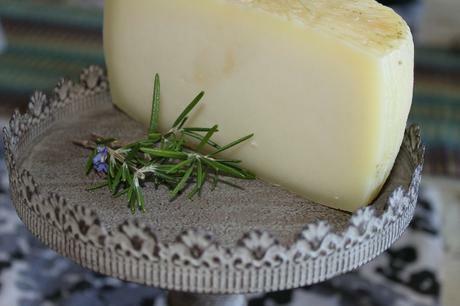 Caciotta: a deliciously creamy new cheese discovery from Puglia Cheese. A sip of 2001 vintage De Krans port was a fitting end to a rather rushed merry-go-round. One final tip, though, but this one is about the cheese makers in the foyer. National Cheese Qualité Awards winners were on show, some more prosaic than others – I’m not sure sliced cheddar is my idea of an elegant wine pairing. But there was yet another discovery – this time for cheese lovers, which I very firmly though dangerously am (please don’t read this, Mr Cardiologist). Puglia cheeses: Mozzarella and Caciotta made right here in Montagu Gardens by Italians from, of course, Puglia on the East Coast of Italy. This means the milk comes from cows (it’s an East Coast thing), not buffalo, but is none the worse for it. The creamy-soft, semi-hard Caciotta Primo Fiore is particularly delicious: just don’t tell me the cholesterol content! 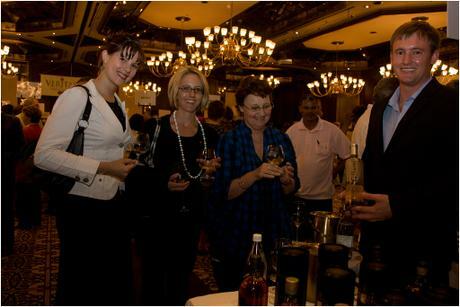 The man from Van Ryn, glowing a little along with some brandying punters under THOSE chandeliers!